Today feels like a paella day. The weather this summer has been simply marvellous! Best summer ever! I always cook my paellas with basmati rice. I love the texture of basmati, I find it really easy to cook and the fluffy texture is simply divine. I must admit, I'm far from brand loyal when it comes to rice. I always choose the rice on special offer in a bag big enough to last me a good few months. So when I was approached by Uncle Ben's to cook up a recipe using their Classic Basmati Rice (ready in just 2 minutes), I jumped at the chance having never tried Uncle Ben's rice before. Speedy healthy, nutritious family meals is what I'm keen on, so if I can save some time swapping out the traditionally cooked basmati rice, for 2 minute basmati rice, I'm up for giving it a go. This one-pot mushroom and courgette paella recipe is adapted from my Garden Vegetable Paella family recipe in my Flavour-led Weaning Cookbook simply because I had to amend the cooking method based on using 2 minute rice. I've also added a few extras to make this recipe even more delicious, and MY GOODNESS it really is! My little one and the hubby were wolfing this down and after a full plate each, both went in for a second round. The delicious moreish flavour, combined with the usual chit-chatting at the dinner table made this a truly wonderful meal. We love our mealtimes. Dinner time is family time. A time to eat delicious food, and spend time together - it really does bring us closer as a family. As this meal was such a hit, I will be adding this to my weekly meal plan. Do give this recipe a go and leave a comment letting me know if you'll be adding it to your weekly meal plan too. Suitable for vegetarians and vegans, packed full of flavour and British garden vegetables, this meal is great for energy, protein, fibre and for filling up your hungry brood. Heat the olive oil in a deep saucepan (ideally non-stick), or a deep cast-iron pot. Toss in the garlic, cumin seeds, chilli flakes, birds eye chillies, saffron, turmeric and the parsley - sauté for 2 minutes on medium-low heat until a paste/ masala is formed. Then crumble in the stock cubes (I used Oxo because they are crumblier than others), add a splash of water, black pepper and salt to taste. Saute for a further 2-3 minutes. 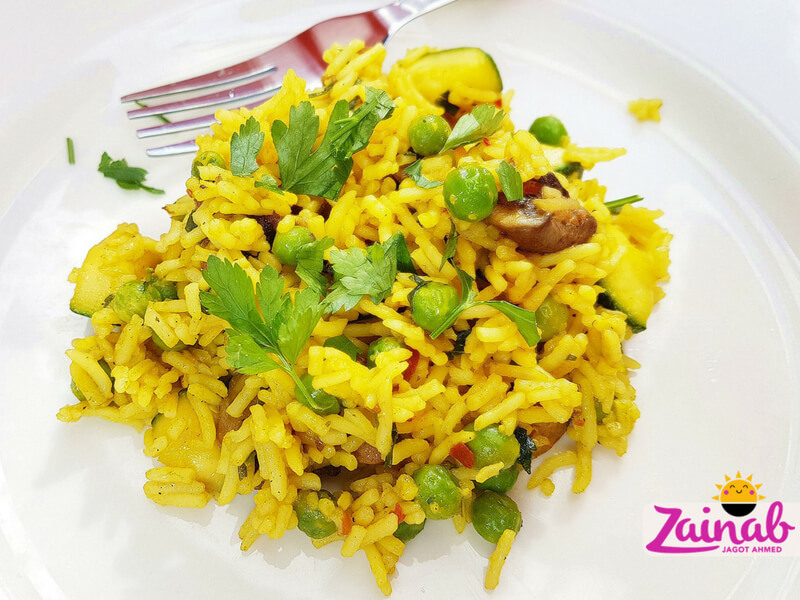 Add the mushrooms, courgette, peas, and stir well to coat the vegetable in the masala. Sauté for 6-7 minutes until the vegetables are tender, but still have a bite to them. Press the Uncle Ben's pouches with your fingers to separate the rice, then tear off the top and add both pouches to the pot and stir to combine with the vegetables and spices. Add 4 tablespoons of boiled water (according to packet instructions), give the rice another quick stir, cover and simmer on low heat for 3 minutes. Once cooked, cut the lime in half and squeeze the juice from both halves onto the paella, then stir gently. Sprinkle the remaining parsley over the paella to garnish and serve.